AUSTRALIA’S PRIME MINISTER Malcolm Turnbull has marked an unwanted milestone by losing his 30th straight opinion poll – a benchmark he used to justify deposing former Liberal leader Tony Abbott. 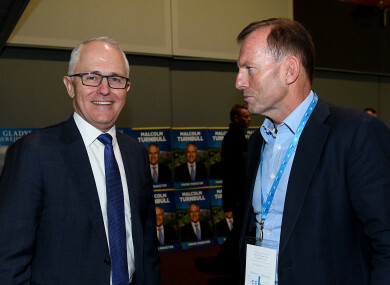 Turnbull said the rationale he applied to Abbott should not also apply to him, “I regret making those remarks at the time, making the remarks about 30 Newspolls. Asked whether he felt vindicated by Turnbull also losing 30 Newspolls, Abbott insisted to reporters: “It’s not about me, it’s got to be about our country,” while defending his right to “speak my mind”. Rumblings in the media about a challenge to Turnbull refuse to go away with Abbott, Foreign Minister Julie Bishop and Home Affairs Minister Peter Dutton in the frame, although a move is not seen as a serious option yet with the public having little appetite for more change. Bishop said “I don’t envisage those circumstances at all” when quizzed on whether she would consider a challenge if she was asked to do so by colleagues. Finance Minister Mathias Cormann said the prime minister had the support of the party. “It’s not unusual for incumbent governments in between elections being behind in the polls, I mean we’re not actually that far behind, truth be told,” he said. The latest Newspoll showed Turnbull’s Liberal/National coalition trailing Labor 48 to 52 on a two-party preferred basis. But Turnbull has a narrow lead as preferred prime minister compared to Labor’s Bill Shorten. “It’s Mr Turnbull who said that 30 Newspolls is a definition of success. That’s his problem,” Shorten said. Email “Australia PM loses 30th consecutive opinion poll - a benchmark he used to oust former leader ”. Feedback on “Australia PM loses 30th consecutive opinion poll - a benchmark he used to oust former leader ”.